Central Texas has been experiencing drought conditions for several years and there is a possibility of continuation. The changing weather conditions that have seen record low and high temps, unusual flooding, and drought. If these extreme conditions continue, we must learn to deal with them. Caring for our trees is an important part of coping with unpredictable weather patterns. Does a less-than-normal rainfall for one year constitute a drought? Probably not. Generally, a drought is considered a prolonged period of unusually low rainfall and the accompanying water shortage. The lack of rainfall is over a time period long enough for the moisture in the soil to be depleted, resulting in plant damage. Without water, nothing can live—plants, animals, or people. Water facilitates the biochemical and biological cell processes, and transports nutrients from the soil into the tree. Therefore, it is probably the most critical element in the life of a tree. It is important to understand the health of the trees that are your responsibility. If you are a landowner, whether of business or residential property (or both), it is up to you to care for the trees on your property. Trees are such a vital element of our landscape that it is crucial that you take your responsibility seriously. Even if you don’t think anything is wrong with your trees, it is a good idea to call on a certified arborist to come out and evaluate the health of your trees. This should be done at least every five years or so, and more often under extreme weather conditions. If you notice that your tree isn’t looking up to par, maybe the leaves are droopy or yellowing, you should call a professional to come have a look at it. A certified arborist is trained to detect signs of drought stress in a tree. By the time you see the obvious signs of distress, the tree may already be very sick. Some of the outwardly noticeable signs that your tree may be experiencing drought stress are leaves that are wilting, turning odd colors, turning brown but not falling, or leaves that fall too early. Branches or twigs that are dying or dead is another indication that all is not well with your tree. If you see any of these signs on your tree, call a professional right away. A certified arborist knows how and where to look for the not-so-obvious signs that your tree is in distress. For instance, mushrooms growing around the base of the tree are an indication of trouble. An arborist will look for signs of internal decay, termite and carpenter ant activity, and nesting holes. Tiny root hairs that grow out from epidermal cells and the feeder roots of the tree are the main source of water intake for the tree. These tiny roots lie no more than about fifteen inches deep in the soil under the tree. During drought conditions, these delicate roots dry out and die, which leads to the distress and eventual death of the tree, unless remedied in time. Trees that grow in woodlands and forests, with no caretaker to water or tend to them, will eventually die. Trees that grow on private property have a better chance of withstanding drought if the property owner is attentive to their needs. A drought that occurs in one year, or over a period of several years, will have a long-range effect on trees. A tree may not show signs of drought distress for a couple of years or more after the drought has ended. Therefore, it is imperative to care for your trees during the drought, whether they show signs of stress or not. Newly transplanted trees are especially vulnerable to drought, as their root system isn’t fully established yet. It can take a tree’s root system two or three years to become fully established. Besides the drought effects on trees that we’ve already discussed, there are secondary effects as well. When a tree is under stress from lack of adequate water, it is more susceptible to insect infestation. That is why a certified arborist will look for carpenter ant, bark beetle, and termite invasions, along with other harmful insect damage indications. Tree diseases such as root or wood rot, wilt, or cankers may also be the result of drought conditions. 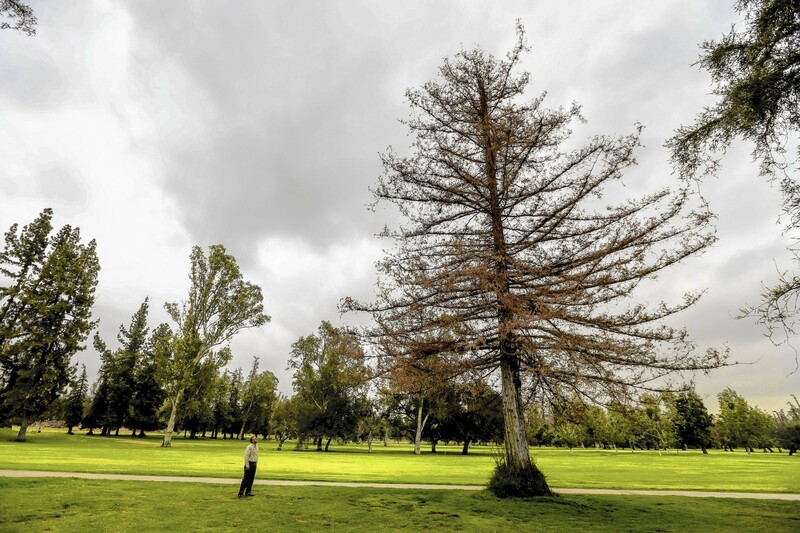 One disease that can affect drought-stricken trees is called Armillaria root rot. It is a fungus that attacks roots when they are weakened by drought. This type of root rot invades the cambium tissue and can kill a small tree within a couple of years. If the tree is large and has an extensive root system, the disease may not be discovered until the fungus has killed half the root system. The Cytospora canker and the Nectria canker are two types of cankers that may be caused by drought. Because the tree is under stress during a drought, and lacks adequate water to nourish its systems, the tree is unable to ward off these types of cankers that infect the tree. Some other diseases that can invade a drought-stressed tree include Verticillium, Rhizosphaera needlecast, and Diplodia tip blight. Your certified arborist will be able to give you specific instructions on how to care for the types of trees on your property. It is very important to follow these instructions if you wish for your trees to live through a sustained period of drought. With proper watering, mulching, and other care, you can successfully bring your trees through a drought into a more temperate climate year. Because the climate in Central Texas is so variable, you will need to consult with a certified arborist regularly to learn how to care for your trees during all the extreme weather conditions that occur here. Then your trees will provide you with pleasant shade and beauty for many years to come.